Learn HTML Language And Create Your Own Website, Using A Simple Text Editor Like Note Pad. No Need To Attend Any Class Training; No Internet Connection Required To Learn. You Can Use This Virtual Training Model And Learn Right From The Comfort Of Your Home Or Office. Have you ever thought about how the internet works? or have you ever thought about how you could sit down and from the comfort of your home or office, download a file hosted on the internet? I strongly believe a lot of people use the internet but majority of users had never sat down to think about how browsers work, how websites are designed and how you link from one page of a website to another – Even those who even think about it, reckon the same as the creation, by some extra ordinary or super-terrestrial human beings – But this is far from the truth. Well, if you are in the same situation, I would not blame you because I was like that before. The way I see rapid change in technology, the creation of programs, that make life so simple, made me wonder if these were not created by humans – My curiosity was aroused. Thereafter, I made up my mind, in 2002, that I must be a computer literate. This was the time my journey started to keep learning computer programs while worked as account officer, account supervisor, accountant, Financial controller, Financial analyst, in various organization that cuts across trading, commercial banking, investment banking, oil and gas and manufacturing. Yet, my quest to be IT literate never waned. I kept learning and even up till this moment, I am still learning because one would not know the use to which these soft skills can be put to use. Among all the programs I learnt such as Ms Office programs, I dabbled into web design as well, most especially web design coding using HTML. In fact, I used to be scared when I see some seemingly unintelligible HTML scripts until I found out that it is one of the most simple language to learn, among program languages. This same language is called “Hypertext Mark-up Language, which is the language used in creating websites using a simple text editor like notepad. Although, you cannot completely exhaust all the knowledge required for website creation since there are so many programs like Joomla, wordpress, PHP, Ruby On Rails, Dreamweaver etc, used in creating websites. Whatever, the case may be, the starting point is the understanding of HTML. This is because server side langauges like PHP, dynamically generate HTML codes. If you want to learn HTML, you need to attend a web design class. Although, you can learn HTML on your own, I guess you would not want to do that because it can be a tedious task, to learn a seemingly strange language on your own. This is even worse, if you have no one to boost your morale. On the other hand, if you would attend a web design class, you may have to pay about N80,000 for a 6-weeks weekend program, 14-working days weekdays program or even a 5- working day crash program for about N40,000 to N50,000. Also, you busy work schedule may not afford you the time to attend class training. As a result of your desire to learn web design without spending so much and with a flexible arrangement which you can control, I have decided to create a training model that will suit your objective – A cost-effective and convenient training program. learn the about the kind of data that web servers sends to your web browsers. This knowledge will help you learn how you can enter your log-in details on website and how the web server delivers the information you requested for and how such information are displayed on your browser. Learn the language used in creating websites – HTML and how to add style to your websites using CSS, which is the acronym for “Cascading Style Sheets”. Your knowledge of HTML and CSS will be a springboard to learn server side languages, such as PHP etc. It is cheap and very convenient. It is the best program for people who don’t have time to attend class training. What Is The Course Contents For This Program? Module #1- Learning About The Internet:-This is just a video presentation about the workings of the internet. It include just one video and a PowerPoint Slide. You will get this video immediately on registration. Module #2- Getting Started With HTML:-This module comprises 3 videos that teaches you about the tools you need to get started with, definition of HTML as well as HTML syntax and tags. You also have working files for these videos. This Module will be delivered along side Module 1. Module #3- Writing Your First HTML Scripts:-This module comprises 4 videos that teaches you how to set up your HTML Editor using note pad. Also, you will be introduced to the “div” and “section” tag. 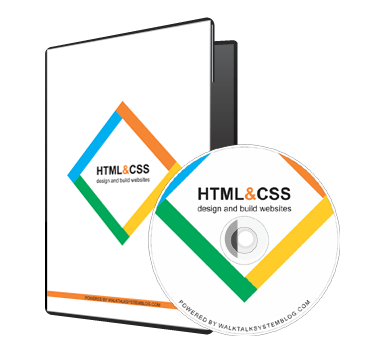 More also, you will learn how to set the structure of your HTML documents as well as add texts to your HTML documents. This will be delivered 2 days after module 1 and 2. Module #4- Adding Image And Links:-This module comprises 3 videos that teaches you how to add image to your web page using the image tag, create multiple web pages and use the anchor tag to create links between one web page and another within your website. This will be delivered alongside with Module 3. Module #5- Creating A List And A Table:-This module comprises 2 videos that teaches you about 3 types of list tags and how to use them as well as using the table tag to add table to your web page. This Video shall be delivered 2 days after Module 3 and 4. Module #6- Using The Div, Span And Nav Element:-This module comprises 4 videos which will be delivered alongside module 5. Here, you will learn how to use the “nav,div, and span” element. You also have a video that throws more light about the complexity of websites. Module #7- Tag Review:-This module comprises 5 videos and will be delivered 2 days after module 5 & 6. Here, you will take a review of some tags you would have become familiar with such as the head tag, Paragraph tag, Line break tag, Horizontal tag etc. Module #8 Tag Attributes Review:-This module comprises 2 videos and shall be delivered 2 days after module 7. Here, you will learn more about tag attributes on your HTML documents. You also have a PDF document for a list of attributes you might want to explore. Module #9 Formatting With HTML:-This module comprises only 1 video and will be delivered 2 along with Module 8. Even though it is advisable to use HTML strictly for contents and CSS for styling, we can still see how we can use HTML to format our web page. Module #10 Using Phrase Tags:-This module comprises 1 video and shall be delivered days after Module 8 and 9. Here, you will learn about phrase tags and how to use them. Module #11 Using Meta Tags:-This module comprises 2 videos and shall be delivered alongside module 10. Here, you will learn about meta tags and also how to use HTML comments. Module #12-Table, Image And List Review-This module comprises 4 videos and shall be delivered 2 days after module 10 and 11. Here, you will go greater depth to learn about more table, image and list attributes. Module #13-Link Review-This Module comprises 4 videos and shall be delivered alongside Module 12. Here, you will learn more about linking web pages, adding downloadable files, link to specific area within a web page, as well a creating an image link. Module #14-Understanding The Concept Of Block And Inline Element:-This Module comprise only 1 video and shall be delivered 2 days after module 12 and 13. Here, you will get more light into Block and inline elements. Module #15-Learning About HTML Background Colours:-This module comprises only 1 video and will be delivered alongside with Module 14. Module #16-Learning About HTML Fonts:-This video comprises only 1 video that teaches you about font style, size, etc. It will be delivered at the same time with Module 14 and 15. Module #17-Styling With CSS Basics:-This is the second part of this training series that teaches you about how to add styles to your HTML document. It comprises a number of videos which shall be delivered at once, 3 days after Module 14-16. Here, you will understand basic CSS rules, use Class and IDs to add CSS, learn about different types of selectors and how to 3 ways to apply CSS to your HTML documents. Module #18-Website Layout With CSS:-This module comprises 8 videos that teaches you how to create layout with CSS. Here, you will understand about box and block properties, margins and padding, as well as background image. Module #19-Adding Forms To Your Document:-this module comprises 5 videos that will teach you about form elements, form tags, style forms and add same to your website. you will also learn how to create contact forms. Module #20-Adding Multimedia -Video & Audio:-This Module teaches you how to add videos or audios to your website. You will also learn about video tags. There are 4 videos on this module. Module #21-Completing Our Website Project:-Module comprises videos that shows you how to complete your website, testing the site, validating your HTML documents, SEO consideration as well as webhosting. How Will This Training Be Delivered? These course shall be delivered via email on downloadable Zip Folders, through a follow up series as no one-time download is available at this time.